A week ago, Amitabh Bachchan started working on Ram Gopal Varma’s next directorial venture Sarkar 3. Amitabh Bachchan is returning as the gangster Subhash ‘Sarkar’ Nagre. 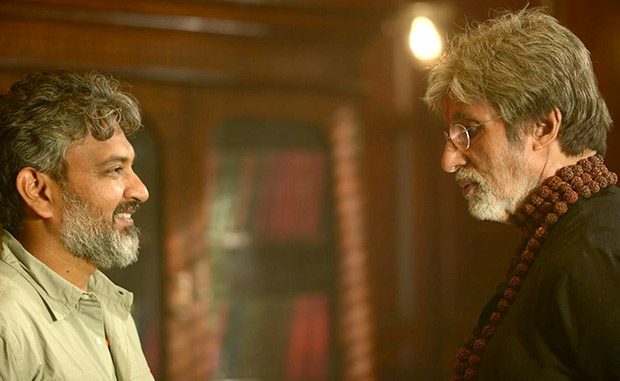 While shooting the film, Amitabh Bachchan got a sweet surprise from, Bahubali director SS Rajamouli. When the ace filmmaker heard that Amitabh Bachchan was shooting nearby, he decided to pay him a visit. He shared the photos from the filmmaker’s visit on the set and wrote, “The genius director Rajamouli of that colossal film ‘Bahubali’ on set of SARKAR 3 .. a simple humble man ! !” The duo had a good time meeting each other. Sarkar 3 also features Manoj Bajpayee, Ronit Roy, Amit Sadh, Jackie Shroff, Bharat Dhabolkar and Rohini Hattangadi.